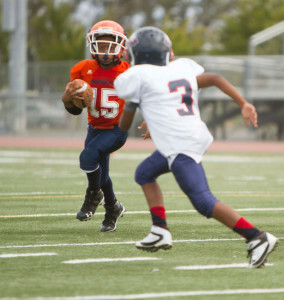 I will admit it: I cringed at the idea of my son playing junior league football. I cringed at the violence, on the field and off, and the behavior of some players who should know better: the men who play in the NFL. And I cringed at the danger of injury, temporary and permanent, faced by many football players. But as my son participates in our third season of junior league football, we have experienced so many positive aspects, especially with positive male influences, that it’s all been worthwhile. 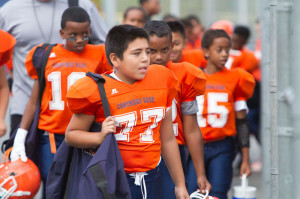 One primary goal in signing my son up for football was because he was having behavioral challenges at school. I thought Shamar needed a place to express his energies and frustrations in a positive environment, without fear of being punished. Another important goal was for my son to be part of a team. With him being an only child, I realized it would be necessary for him to be around other children with common, positive goals. But my number one reason for having him play football was so he would experience the discipline and training from positive adult male influences. Although I have an abundance of love for my little boy, I know that as a single mother, I cannot replace the male energy and influence he needs to balance his life. The results have surpassed my expectations. When my son’s grades started to go down during football season, the issue was immediately addressed after I spoke to a board member of our junior football league, Rick Lewis. He referred us to an organization called the Alpha Academy. One function of the academy is to provide tutoring services to young people. The Academy stepped in and helped us. As the season progressed, my son still had some behavioral problems. Being benched a couple of times forced him to make better choices. He decided he would rather spend his time on the field than sitting on the bench while the other boys played. The coach’s positive attitude goes a long way toward easing my concerns about the violence in football. It’s all about my desire to see my son grow up and become a successful man. Other parents whose boys play for our team share my goals. So do parents whose boys play for other youth football teams. Single parents like me know too much about challenges such as time conflicts. It is not easy to arrange our work and school lives to accommodate our children, but we always manage. We also carry the fear of our children being injured in football. It is always out there, the potential of seeing your boy hurt on the field. With that said, the joyous moments of watching your child make positive decisions in life can become unforgettable thanks to the core values and discipline young men find in youth football. Personally, I love driving home from a game and hearing Shamar talk about how he gave 150 percent to his team’s winning effort. It means so much. By the same token, I am quietly gratified to hear that he was benched because of low grades or bad behavior in school, that there was a consequence to his actions. Not only does the Cosumnes Oaks Junior Wolf pack team address behavior and academic issues, they also require that the boys and girls in the program give back through community service. The boys and girls are expected to serve as mentors to the younger junior kids after they enter high school and college. My son cannot say enough positive words about his mentor coaches, both former players and those currently playing for the Sacramento City College Panthers. 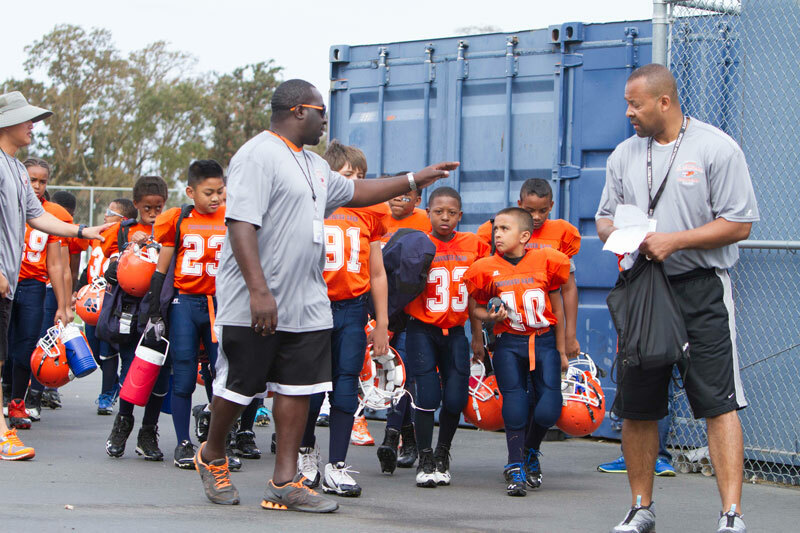 The saying goes, “It takes a village to raise a child.” My son’s football team and youth football league are one of those villages. They are helping my son on his journey to a healthy, happy and successful life. Ms. Knox works as an assistant and photographer at the Sacramento City College Cultural Awareness Center. She has a passion for photography and community service and holds an Associates degree from City College in photography. She is involved with many organizations, including Head Start and San Francisco Junior Giants, on behalf of her son Shamar, who attends Camellia Basic Elementary. Such a great story of how a single mom didn’t sit down and wait on things to get better. You started the proverbial ball to rolling, you reached out and found something that could help you and your son. I love that you allowed them to chastised him, for his good. Your writing is so easy to read and I felt like I was right there with you experiencing every moment of progress your son made. I’m glad you shared this story with us, and I will pray that your son continues to make right decisions. Not only are you a great photographer, you are a good writer as well. What a great piece. I enjoyed reading it and cheering both you and Shamar on your game! Keep up the great work, and the great writing.